Jiangsu Province Foundry Association’s went on an inspection tour in America which last from Fouth to Thirteen in April, 2013. It is an successful and beneficial tour which will have an positive influence on improving the foundry factories’ produce and management level in Jiangsu Province. Also it will help learn America’s experience on energy saving and emission reduction, quality and efficiency. 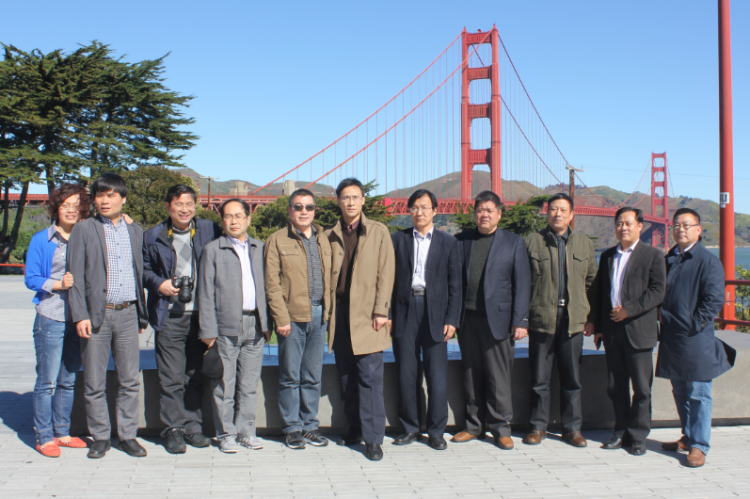 Following the lead of Lu Wenlong, secretary general of Jiangsu Province Foundry Association, a delegation consists of twelve representatives from ten foundry factories and raw material suppliers in Jiangsu Province goes on a seven-days tour in America. The delegation inspects five cities including Mapleton, St.Louis, San Francisco, Las Vegas and Los Angeles. In Mapleton, we visits Caterpillar which is the world's largest manufacturer of earthmoving and construction equipment and a major global producer of diesel and natural gas engines and turbines. Five managers of Caterpillar accompany and explain to the tour. In St. Louis, the tour goes on a visit on American international cast expo, which was held every three years and on a large scale of foundry materials, techniques, software,special casting and equipment. The tour organizes a communication activity with American Foundry Society(AFS). This is Jiangsu province’s foundry enterprises ‘another foreign tour since the visit in Japan during March of 2012. It is said that all the delegation members think it is beneficial and wish more inspection activity will be held and promote the foundry enterprises into international level.